Manual palpation, used to locate lumps or to determine tissue stiffness, is limited to what physicians can reach with their hands, leaving some diagnostics literally beyond their reach. Ultrasound elastography offers a technological alternative to palpation. The noninvasive imaging modality images tissue firmness to help assess lesions and gather quantitative information regarding the state of disease or tumor development. The main idea is that tissue hardness or softness will offer diagnostic information about the presence or status of disease. Cancerous tumors are harder than the surrounding tissue; diseased livers are stiffer than healthy ones. The earliest form of ultrasound elastography is strain imaging, first studied in the United States in the early 1990s. Ryan J. DeWall, PhD, a researcher with the injury biomechanics application group at Corvid Technologies, refers to this technique as "virtual palpation," as it involves compressing the tissue with the ultrasound transducer, resulting in a "map" of where tissue appears stiff and where it appears soft. "Stiffer tissue deforms less than softer tissue," DeWall says. "In the case of breast scans, for example, that pressure is applied to the breast with the ultrasound transducer and the images displayed show the relative distortions, or strains. The areas in the breast tissue that appear the stiffest correlate to where cancer is located." There are some limitations with this method, he says. Compression can cause undue movement within the tissue, which could negatively impact the imaging and cause issues with interpretation. Also, as with manual palpation, it is a difficult technique to use with organs or tissue some distance below the surface or in an area that is difficult to compress. Another method of ultrasound elastography is called acoustic radiation force impulse imaging and it uses ultrasound to create a qualitative 2D map of tissue stiffness. This is done with a focused ultrasound beam that creates a push inside the tissue using an acoustic radiation force. Softer tissue is more easily pushed than stiffer tissue. As the process continues, a map is created showing where the areas of stiffness are located. A similar technique is supersonic shear imaging (SSI), which DeWall uses in his research at Corvid, where his work involves helping to design equipment that protects military personnel from injuries caused by improvised explosive devices for use by the US Department of Defense. The acoustic radiation force used to create the push with shear wave imaging measures stiffness by how fast the shear waves travel through the tissue. This results in a 2D qualitative map of the tissue's stiffness. In the minds of researchers and clinicians alike, one of the appeals of using ultrasound elastography as a diagnostic tool, regardless of the technique, is its broad application across organs and patients. "Ultrasound elastography can be used anyplace where tissue can become stiff or tumors can develop," says Jonathan R. Dillman, MD, an assistant professor in pediatric radiology at the University of Michigan Health System and a radiologist with C.S. Mott Children's Hospital in Ann Arbor, Michigan. "There is a lot of room for application and study." DeWall, formerly with the University of Wisconsin-Madison's department of radiology and medical physics, notes that initial applications were organ-specific and based on where they are located in the body. Easily accessible locations, such as the breast, were first targets. Overall, the technology is most useful in areas where manual palpation is the standard course of determining the presence of tumors or tissue stiffness, such as with breast, thyroid, and prostate cancer. "Breast imaging is an area where ultrasound elastography is being considered the most," DeWall says. "It's a useful way to differentiate between tumors and healthy tissue. Tumors will appear stiffer than the surrounding tissue." With breast cancer, DeWall says that much of the information gathered with ultrasound elastography has the potential to determine whether or not the tumor is benign or cancerous. "While we're not there yet, there is the potential for ultrasound elastography to help us avoid biopsy," DeWall says. In diagnosing liver disease, where stiffness could mean the presence of fibrosis, ultrasound elastography could lead to the diagnosis of diseases such as cirrhosis and hepatitis. "Fibrous tissue in the liver is stiffer than normal tissue," DeWall says. "There are a lot of studies correlating shear wave findings with the level of fibrosis. The hope is that we can determine how far along the disease has spread and do so without having the patient undergo the stress of surgical biopsy." DeWall's work pertains to musculoskeletal issues such as injuries to muscles or tendons. In his latest study, DeWall uses SSI to study variations in positioning of the ankle and the ultrasound transducer when it comes to assessing the Achilles tendon. He and other researchers on the project observed "significant" spatial and posture variations in tendon shear wave speeds in 10 healthy young adults. They found that shear wave speeds were only somewhat correlated with the thickness and depth of the tendon, suggesting that variations were due more to the positioning. Further studies in this area could show a use for ultrasound elastography in measuring how tendons heal, DeWall says, or be used as a method for evaluating treatment options for diseases of the tendon, such as tendinitis or tendinosis. Finally, this modality could be used to examine the effects of aging on tendons. "Shear wave imaging is analogous to throwing a rock in a pond and watching the ripples," DeWall says. "The wave pattern is related to the thickness of the tissue or the tendon." He says there are factors to consider when looking at those wave patterns. "We need to look at how we measure the waves, whether we measure along the fibers or against the fibers," he says. "What difference does it make which way we measure? Fibers tend to guide the wave, so how does that influence the stiffness measurement?" When imaging larger organs, such as the liver, DeWall says there is less interruption in the wave, which can affect results just as much as interruptions in the wave pattern. "These are all factors to consider when trying to determine shear wave speed," he says. Ultrasound elasticity imaging can also play a role in determining the age of a patient's deep vein thrombosis, Dillman says. Older blood clots are harder, more chronic, and less likely to break off and travel through the body. Evaluating clot maturity can help doctors determine the right course of action for treating a patient's potentially life-threatening circulation issues. Other considerations include the use of this noninvasive modality with children. Dillman is currently looking at the repeatability and reproducibility of superficial shear wave speed measurements in a pediatric population, acquired from elasticity phantoms at varying imaging depths. The study includes information gathered using three imaging methods, two ultrasound systems, and multiple operators. In the end, he and other researchers in the group found minimal variability in measurements across methods, transducer combinations, imaging depths, and operators. Work in this area is ongoing, he says, with the exact clinical significance of the variation uncertain. For example, measurements could change depending on the organ being imaged and the patient's specific disease. In relation to the child-sized digestive system, Dillman says shear wave imaging can be used to determine how stiffness in the bowel changes in relation to a child's Crohn's disease. Scarring in the bowel caused by the disease causes stiffness, so by using ultrasound elastography, doctors can track advancement of the disease. "Bowel wall fibers are hard to detect using standard techniques such as CT or MRI," Dillman says. "That's why we're looking for more novel ways to detect this. Shear wave may be able to help with that." Ultrasound elastography also stands as a viable alternative to biopsy in pediatrics, he says. Children who undergo biopsy are typically sedated for the procedure because it can be a traumatic experience for young patients. Biopsy also leaves children exposed to the potential for infection. 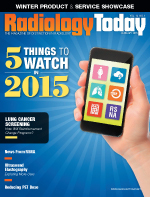 On the horizon for ultrasound elastography are even more wide-ranging applications. For example, DeWall says there are studies under way that involve a special ultrasound probe to use elastography methods to examine the cervix for potential disease. In addition, he says there is talk of looking at the potential for using this technique for examining cervical ripening in pregnant women. "There's not a lot of work in this area yet, but it's on the way," he says. As the FDA approves more applications of ultrasound elastography, DeWall says interest increases for using this noninvasive option to study disease. "In the next few years I think we will discover many more indications for the use of ultrasound elastography that we haven't even thought of yet," Dillman says. — Kathy Hardy is a freelance writer based in Phoenixville, Pennsylvania. She writes primarily about women's imaging issues for Radiology Today.